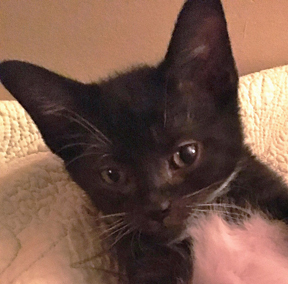 Amelia is an intrepid wee kitten who set out to explore her new environment within minutes of arriving at her foster home. By the end of the evening, when her siblings were all snoozing together on their bed, Amelia had charted every inch of the (admittedly small) apartment and can often be found sleeping in the oddest places. She is, however, as affectionate as she is fearless, and a purr that is a joy to behold. Amelia is perfectly happy amusing herself. She has been exposed to older cats, new people and a very large, somewhat grouchy, dog.